The effects of climate change, like sea level rise, are top of mind these days and at Virgin Hotels, we all want to know what we can do to save the planet for future generations. To celebrate Women’s History Month this March with an eye towards Earth Day on April 22, we want to introduce you to a powerful team of women at The City of Miami Beach’s Environment & Sustainability department working to address the most pressing environmental issues of our time. With Miami in the headlines as “ground zero” for sea level rise, their team is implementing adaptation plans and making real changes to positively impact their community. Miami also happens to be HQ for Virgin Hotels, so we’re especially invested in the work they do. Aligned with 100 Resilient Cities and the Bloomberg Challenge, their efforts resonate beyond Miami Beach for a global impact. Read on to meet these impressive women and learn how you can play your part in healing the planet. Our department focuses on initiatives that enhance our natural environment, protect and preserve our urban forest and increase communitywide sustainability. Basically, we’re making Miami Beach the destination everyone wants to live in and visit. What is Miami Beach doing to respond to sea level rise? 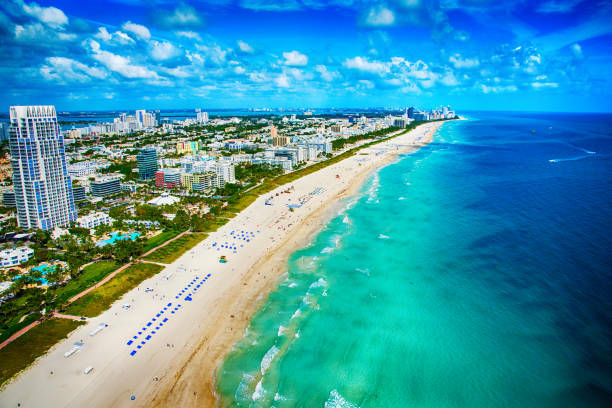 Miami Beach is leading the way in sea level rise adaptation and climate change mitigation. We are raising roads, upgrading our stormwater system, and implementing green infrastructure solutions to help keep our city dry. What’s one thing everyone can do to reduce their carbon footprint? Walk or ride your bike. For short distances instead of hoping in your car, take the healthier option not just for the planet, but for your personal wellbeing, too. Tell us about an initiative you’re excited about. We had our first yearlong Artist in Public Life residency in collaboration with Art Center South Florida and artist Misael Soto. He built a Greco-Roman amphitheater out of sand and we used it to facilitate awareness of sea level rise and climate change by holding lectures, performances and readings in this vulnerable public space. Why are you passionate about the work you do? I have always been fascinated with the intersection between the natural environment and the society that we live in. I lead the City of Miami Beach’s habitat management, environmental permitting, and regulatory compliance programs. I am also responsible for providing technical support in the city’s sea level rise adaptation and resiliency planning programs. How do you help people understand the threats of sea level rise and climate change? Sea level rise can be scary for people who do not understand the intricacies of the science or the hard work that we are putting into reducing our community’s risk. One of my roles is to help translate technical concepts so that our residents, visitors, and people from other communities will understand, feel less intimidated and join us in finding solutions. How do cities around the world learn from your work? We bring practitioners together from around the region and the world to coordinate and collaborate on projects that restore our local ecosystems, like Biscayne Bay. The most important take-away is that local communities do not have to wait for the federal government or their state governments to take charge. Our elected officials and our city leaders were not afraid to start acting to address sea level rise and it has put our community in a much better position to face our challenges. I lead citywide efforts to incorporate sustainability into capital projects, operations and regulations through strategic policy, while improving efficiency, cost and longevity. What’s an initiative you’re particularly proud of? Our #PlasticfreeMB program in collaboration with our Communications Department recognizes businesses that have taken action to reduce plastics. We help organizations implement best practices in environmental stewardship. The impact we have in the community and at a global scale. It’s amazing when you see a policy being adopted and implemented and how it can assist a community to become more resilient and sustainable. What’s a common misconception about sea level rise? I think it’s important to recognize that cities all over the country face risks, from earthquakes to wildfires and ice storms. Sea level rise and flooding are significant concerns all over—from the Midwest to South Florida. Since we are so aware of our risk here, we’ve been very focused on reducing it. Aging infrastructure is a major national challenge and in Miami Beach, we are replacing our aging roads and pipes to address sea level rise. Garden. Trees, plants and biodiversity do a planet good. There’s too much suffering from natural disasters in this world and I believe we are working to prevent that. At heart, I’m a problem solver and an innovation nerd. I’m comfortable working in a challenging field on projects that have never been done before. How can we learn more about Miami Beach’s resiliency plan? Visit the amazing website MBrisingabove.com and download the app that Elizabeth and her team developed. Or come visit Miami Beach!